This quinta (farmhouse) is particularly quietly located on approx. 3500 m2 of its own land in terraces with grapes, olives, etc. The quinta is situated near a little path that leads to a brook, there is virtually no traffic except a flock of sheep now and then ! From the large roofed terrace with its fixed barbecue you have a beautiful free view on the valley. The holiday home is simple but practical and offers everything you want for a great stay in the quite unknown province Beiras. The granite stones give it a very authentic style. 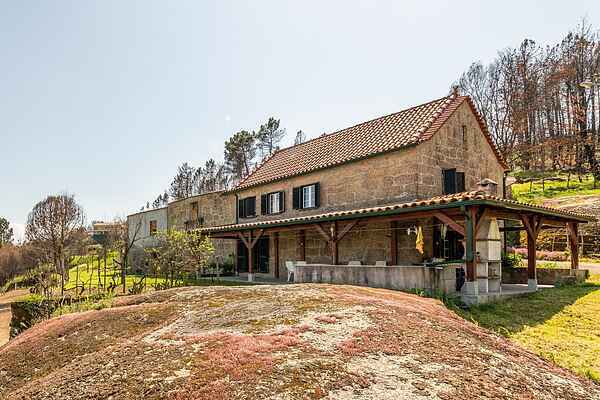 The quinta also includes a large detached barn with original oven. There are a few natural parks nearby such as the highest area in Portugal, the Serra da Estrela (national park), and the Serra da Açor. There are idyllic rivers at 5km (Alva) and 15km (Mondego). Touristy interesting places to visit are for example the impressive student city Coimbra (70km) with its beautiful university ; Piodão, an authentic mountain village (Unesco world monument, approx. 20km) ; the village Lourosa with the oldest church of Portugal at approx. 4km ; the picturesque places Avó and Vila Cova de Alva at approx. 10km ; and the great monastery park of Buçaco at 30km.